Code4PA is a codeathon that encourages learning, collaboration, growth, innovation, and fun among PA’s network of technical talent. Through a series of collaborative events, teams will utilize state and local data to generate ideas, designs, prototypes and/or apps to increase transparency and efficiency for public engagement with the government. Remember that codeathons are like marathons. Some people go to compete, but most people take part to better themselves, help their community and have fun. Whatever the reason is you’re at our codeathon, uphold the coder spirit of learning and teaching by collaborating with other teams, helping beginners, and having fun. Utilize data from the data.pa.gov open data portal to generate ideas that will enhance public engagement, increase transparency into trending of state data for greater innovation and use of technology. More datasets are in process of being published for the event, check out the list of actively engaged datasets in process HERE. It is not required to utilize a use case for the Codeathon event, these are to assist with team challenges. A Grand Prize of recognition with the Governor’s Office will be awarded as well as other additional specialty awards. Hear from Stakeholders, meet the sponsors, team formation and idea pitch. Q&A with experts, coding activity, team assist, planning for the month ahead and pitch day. Team pitch, judging, team fun, awards, and pictures. Codeathons have determined that use cases and datasets are becoming larger and wanted to allow teams time to collaboratively work on further expanding upon ideas and designs and apps. 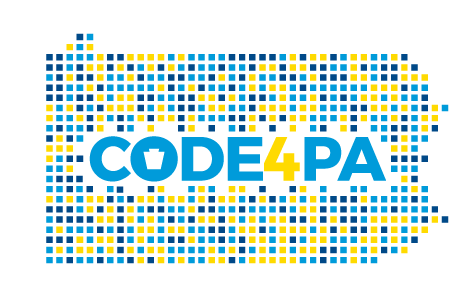 Code4PA is working with the well-established civic coding organization Code for Philly, and the University of Pittsburgh, Carnegie Mellon University and the Western Regional Data Center in Pittsburgh. As part of expanding the capability of crowd souring resource expertise in Philly, Pittsburgh, and utilization of HU technology, this was an excellent opportunity for the Code4PA 2018 codeathon. Registration is at the same link, just be sure to register for your preferred location. Code4PA 2018 is looking for sponsors that are interested in the promotion of learning, collaboration, growth, and innovation among PA’s network of technical talent in helping to find innovative ways to combat the Opioid Epidemic in Pennsylvania.